There’s nothing wrong with checking out something a little more traditional every now and then and in this review we’re checking out Joker 8000 from Microgaming. It’s described as a Scandinavian-style online slot but it will also feel familiar to fans of UK-style games and traditional Las Vegas machines. Joker 8000 is designed to replicate a physical machine and it does that very well; there’s a blurry outline of a casino venue in the background but the foreground is a well-rendered version of the game. There are three reels, five possible paylines and just five basic symbols comprising cherries, lemons, melons, bars and crowns. 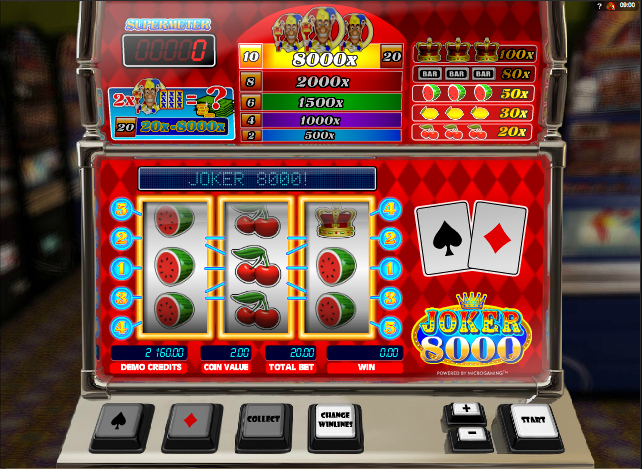 The joker is a scatter symbol which can activate the bonus game. To be eligible to play this feature you must be playing the base game with at least a bet of 10 credits. Thereafter any win greater than 20 credits will offer you the opportunity to play this game. You can collect your winnings but click ‘Start’ to continue on to the bonus feature and you wills see that your winnings have been transferred to the Supermeter at the top left of the screen. Now just carry on playing using these credits. All paylines will be activated and every spin will cost 20 credits. The extra bonus is that if you can land two jokers on any two reels, you will be awarded a mystery multiplier of your line bet of between 20x and 8000x. At any point during this feature you can collect your winnings and transfer them back to the base game. Each base game win can be gambled by using the black and red playing card buttons underneath the reels. It’s just a 50/50 guessing game which will double your winnings. If you don’t want to gamble your entire win you can use the ‘Set Aside’ button to save some of it and wager the rest. We would recommend not using the Super Bonus game with every win; it’s just like a big gamble feature which will ultimately steal all your winnings. The same applies to the base game gamble feature – use it only occasionally, making sure you save some of your winnings. This is an entertaining three reel slot with enough added extras to keep most players amused. The graphics and sounds are a decent recreation of a bricks and mortar casino location.